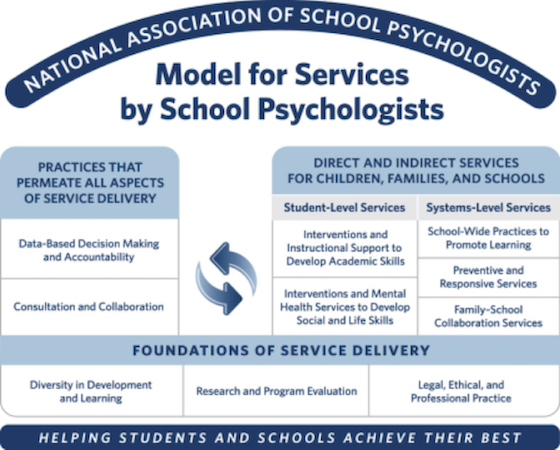 The NASP Model for Comprehensive and Integrated School Psychological Services, also known as the NASP Practice Model, represents NASP's official policy regarding the delivery of school psychological services. School psychologists have a critical role in communicating the importance of our national standards in improving outcomes for students, families, and schools, and in working towards their adoption. Consistent adoption of these standards across school districts and states helps promote a consistency of practice that ensures the public that students will have access to needed services wherever they live. NASP has developed a self-assessment survey for school psychologists to find out how thier practice aligns with the 10 domains outlined in the NASP Practice Model. The survey will provide you with a personalized print-out of professional development needs. Check the online learning center for on-demand professional development that can help you address these areas of need. Designed as an online resource to help schools adopt & implement the NASP Practice Model. This infographic is a powerful visual to convey the roles and areas of expertise of school psychologists to key stakeholders. The infographic can be shared on social media or printed as a handout. This infographic is also available in Spanish and as a .png file.